There comes a time each year when your snow blower must be stored. When the snow has finally melted and the leaves turn green, one should store their machine for the next winter. Proper storage technique is essential to keeping your snow blower working correctly. Without proper storage, your blower’s electrics may fail which could result in a lower-performing machine. It could even cause your snow blower to stop working entirely. We have put together a helpful list to save you from this worry. Follow these steps to ensure that you store your snow blower the right way and don’t get caught in a blizzard next season. The first part an owner is encouraged to check is the pull cord. The pull cord tends to fray which can cause it to snap when pulled. This can be dangerous. People operating these machines have even been known to fall and injure themselves if the cord breaks. Cords that show any sign of fraying should be replaced immediately. All nuts and bolts should be checked for looseness. The machine’s vibration tends to dislodge these vital pieces. Any missing nuts or bolts should also be replaced immediately. Owners of less expensive snow blowers are strongly advised to check the auger pins which tend to break on less expensive models. Those that own top of the line models are more likely to be safe. Those that own two-stage machines (the more popular type) should check their auger. The auger has a tendency to work itself out of alignment during heavy use. The auger should be adjusted until it comes close to the surface, but doesn’t actually make contact. Next, an owner must check the battery of their machine (if your equipment has one). Most batteries should actually be removed from the machine prior to transfer to the snow blower storage area. If not, they can cause damage to the blower electrics. This damage could cost them a new battery or new wiring harness for the snow blower. The most important part of snow blower storage is treating your gas. The gasoline you buy today goes bad in as little as 30 days. You need to fill your gas can with fresh fuel and treat with a high-quality fuel stabilizer. Making sure that you treat the fuel when you buy it ensures that you are keeping it as fresh as possible. Once you are back home, top off your fuel tank with the stabilized fuel and run your engine for 5 minutes to circulate the stabilized fuel. Your fuel and fuel system is now protected for at least a year from fuel-related issues. The last step that snow blower owners must do when storing their machines is changing the oil. This may seem counterintuitive. Most people would think that changing the oil is a waste if the machine will simply sit for months and months. However, this is actually an essential step for owners who wish to ensure the continued health and error-free operation of their machines. Changing the oil in all but the best snow blowers used to be a nightmare. Low end snow blowers were notoriously difficult in this regard. However, this is no longer the case. The oil reservoirs in modern machines are much like the oil reservoirs in cars. There is a bolt in the casing of the oil reservoir. Those wishing to change the oil in their machine only need to undo this bolt, and the oil will drain out. Putting new oil in only requires that the oil be poured through the hole at the top of the reservoir. Owners are advised to put in only the grade of oil specified in the machine’s manual. 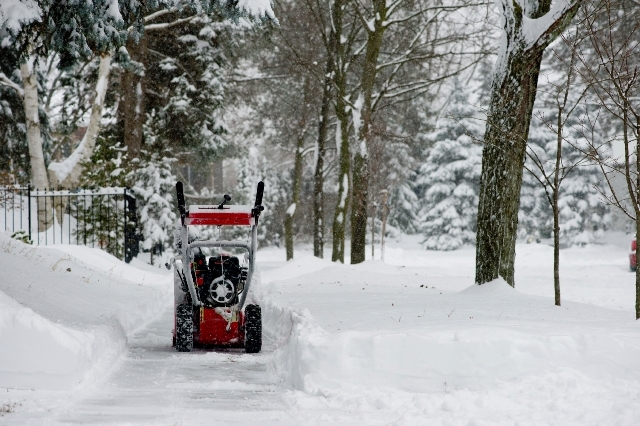 We hope that following these steps help you store your snow blower properly. We wish you many snow-free driveways in the future! I have used fuel stabilizer in the past for my lawn mower. I am confused as two which is better for my new snow blower. Is it better to turn off the fuel shut off valve and run the carburetor dry or add the fuel stabilizer run engine for 5 minutes and leave the gas in the carburetor. Hi Walter, As a general rule, we recommend filling the fuel tank as much as possible (to prevent air-flow and moisture build up), treat that fuel with STA-BIL and then run the engine for a couple of minutes. There is no need to drain. For storing your snownblower, we would recommend STA-BIL Storage. When it’s in use in the winter, we would recommend STA-BIL 360 Performance. Please contact us at marketing@goldeagle.com if you have any questions about this. I have added Stabil Storage from day one to the fuel going into my snow blower. Would it be wrong to add/mix Stabil 360 during the winter months along with continued use of Stabil storage? Also, I read on this site that cleaning your fuel system is important. Can I add fuel system cleaner with Stabil Storage treated gas? If so, is there a recommended fuel system cleaner. Toro PowerMax HD 826 OXE snowblower.